In brief: If only the seating were more comfortable, the space less hectic and more cozy, that 7 rating would for sure rocket to 8 cause the food is mostly always good. It hasn't even been a full month but it should surprise you not at all that Num Pang was roaringly busy. Packed from the moment we arrived until we got up from the chilly bar stools, three weeks in, the place is thriving. We were tempted to go for the known - the delicious sandwiches, but both opted to try a rice bowl instead. It takes a little bit longer to hear your number called, but I'm glad we waited. 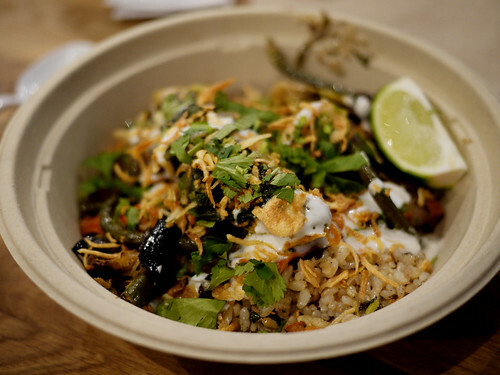 The rice bowls remind M. of the burrito bowls at Dos Toros and me of a Southeast Asian version of bibambap. The combination of ingredients, meat or fish, cilantro, brussel sprouts, green beans, roasted carrots and other unidentifiable things over brown rice, was utterly satisfying on this chilly day.